A CREDIT CARD HAS ONE MISSION-TO MAKE MONEY. Would you open your window while driving and empty your wallet out? Laughable, however too many of us do this without even knowing it. Never ever just open a credit card bill or any bill and just pay it. If you do this then you run the risk of throwing money out the window. This almost happened to us but thankfully we DO read our statements and found a surprising credit card fee that was not expected. Besides earning rewards some people they pay a heavy price for holding a credit card balance and paying the minimum. That’s really not what I’m going to talk to you about today though. Quite the opposite actually which not only sent us to the telephone with our jaw dropped but to find out almost all credit card companies do this. Credit Card Fees…. there’s more than 1. We’ve never once paid any interest to a credit card company and don’t plan to begin but this isn’t an interest charge it’s an over credit limit charge. If you thought that your credit card would send out alarms when you reach your credit limit don’t be fooled, not all do. 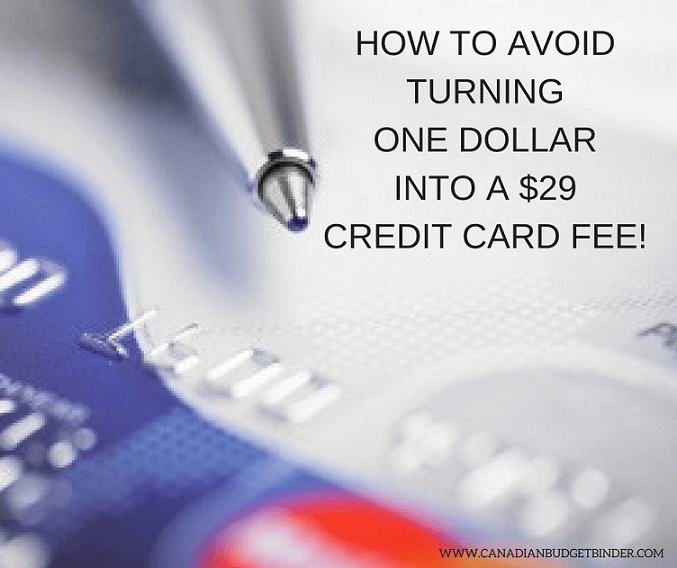 In fact, some credit cards keep on allowing you to charge up to a certain amount and then put a stop to your card BUT not before charging you $29!! A Twenty-Nine-Dollar credit card fee for going over your limit by ONE DOLLAR!! What’s the point of having a credit card LIMIT if you can keep spending over the limit? You could obviously ask for a credit increase if your credit card is in good-standing with the company but why would you if you don’t often reach the limit? This was the first time we spent enough money to go above the limit of a credit card which sadly we believed would be declined if we met that limit. That didn’t happen. We learned our lesson and wanted to share it with all of you just in case you don’t know about this sneaky credit card fee for being credit card naughty. Don’t beat yourself up if you find that you have paid money for something you could have avoided such as a credit card fee. The key is to try and get out of the credit card fee if you’re innocent of the mistake and to never let it happen again. Mrs. CBB remembers a time when she accidentally forgot to move money into her chequing account to pay for a bill and her bank used a $500 overdraft to cover the automated charge. This cost was only $5 with President’s Choice Financial Bank where we still doing our banking. Upon making phone calls to TD Canada Trust and Scotia Bank I found that both institutions charge a $29 dollar credit card fee for surpassing the credit card limit. I get it, I think- but $29? Is this for admin fees or just because they can because the rules weren’t followed. Probably both. I was sad to find out that PC Financial charges the same credit card fee because they are our main credit card which we love. Free groceries are great and well worth owning the credit card. It’s a hefty price to pay for one dollar but when you use money that is not yours they can ding you every which way if their disclosure says so. Who reads the credit card disclosure anyways? Not a lot of people but we should be, in full. It may be boring but it may save you money and headaches down the road. When you exceed your credit limit, you may find that your card is declined or you face a penalty over limit fee for charges that go through above your allowed credit. It’s important to pay down the amount you are over as quickly as possible to prevent further charges being declined. Then assess whether the current credit limit meets your needs. If your account is in good standing, you can apply for an increase.- PC Financial- How to fix a credit card mistake. I’d be smacking myself if I allowed another credit card fee to happen again, especially when we are living on a budget. That $29 could feed a family for a week. Being my own financial advisor means that if I’m not doing all that I can to save what we earn then I’m failing my system. Thankfully I was able to reverse the credit card fee after questioning the credit limit process. When you receive your new or updated credit card in the mail it will always be accompanied by the credit card disclosure pamphlet. This means that you can’t just use your credit card and do what you like with it without repercussions. We learned the hard way…29 times over. Upon arriving back from our holidays in the United Kingdom we thought it would be a smart idea to empty our mailbox. We pick up our mail at a mailbox centre just up the street as does the rest of our neighbours which is common these days as it speeds up the delivery process for Canada Post employees. Dummy me forget to bring a shopping bag with me and sure enough there was a full mail slot as papers fell to the ground. I wasn’t sure to be happy to see it packed with junk mail or not. No one is every smiling when they receive a bill in the mail. Once shedding the marketing adverts I was left with 2 letters one of which was a credit card statement. As you can imagine Mrs.CBB and I use our credit cards to build our rewards points so we can redeem them to save even more money. We don’t own many credit cards but one particular credit card that we use only for online purposes has a credit limit of $400. Since I was working two jobs Mrs. CBB went ahead and ordered clothing and gifts online to take with us on holidays. Of course she made sure she wasn’t paying top dollar for the items but with all of the last-minute running around she never gave much thought to going over the credit limit on our lowest credit card. Ideally, one would believe that the card would stop accepting charges if the credit limit was met or exceeded. This didn’t happen and her final charge sent her $50 over the credit limit. When we tried to order Chinese food upon arriving home from holidays our card was declined. Had someone stolen our card and used it? No that didn’t happen, far from it. After reading our credit card statement that just so happened to be in the mail the picture became clear. She went over the credit card limit and they charged us $29. When chatting to the lovely bank associates at TD and Scotia Bank I was shocked to find out that even a $1 charge over your credit limit will incur a $29 charge. Whoa, that’s heavy for a buck and even the dude on the other end of the line thought it was a bit much. I hope the call wasn’t recorded but maybe they need to hear how ridiculously high of a charge that is. I don’t condone overspending on your credit card but if you do it’s important to be aware that your credit card statement will likely be charged heavy for that mistake. For many people that’s two hours wage for them and then some but we have to protect ourselves. I asked the credit card representative what the purpose of a credit limit was if they didn’t lock out the card-holder when they were trying to make a purchase but were over limit? Her response was, sometimes it does and other times it doesn’t. What? It should just stop when it reaches the credit card limit but this is how money can seep through the cracks for Canadians. Besides not everyone even knows they are getting charged because not everyone reads their credit card statement. $$$. We all make financial mistakes even the people who think they couldn’t possibly do such a thing. After some time to reflect and research along with making the phone call to customer service we realized that it was our fault for not reading the disclosure in full. Skimming doesn’t count either. This also taught us that it’s important to track what you are spending in real-time on a credit card especially if we only pay in full once the bill comes in. Alternatively she offered to put a stop on the credit card if we were to meet the credit limit. WHAT? It should just be this way but we went ahead and did as such. We had no intentions of adding more credit to the card as we don’t use it much. Make that phone call if you don’t want to see extra charges or you must make sure you always stay under your credit limit. Since having the charge removed we thought we would walk you through the process of making a phone call to customer service if this has happened to you and you’re reading this for inspiration. If you’re in good standing with your credit card and it’s a first occurrence they will likely reverse the charge to keep you as a customer, but only once. Explain the situation to the credit card representative and see if they can reverse the charge since you weren’t aware of the credit limit overage fee. Ask for a credit limit stop if they provide this so it won’t happen again. Wasting money is a big no-no in the budgeting world especially when you don’t have much to part with. Keep in mind that we all use credit cards for different reasons but credit card fees show no mercy. How do you track your credit card expenses? Do you pay your credit card once a month or as you put charges on the card? Have you ever been dinged with the $29 over credit limit charge? I look forward to reading your tips and responses below. Great reminder – Thanks for sharing! I generally monitor my bank and credit card statements for anything out of the ordinary. Not just my credit limit, but also want to keep tabs on what is going on in order to avoid unpleasant surprises including identity fraud. In my younger days, I had no fear of just jacking up my credit card limit. It still sits fairly high, so if I ever got a $29 dollar fee for going over my limit, that would be the least of my worries! Great article though, it’s amazing what these banks charge in hidden fees, or fees that slide under the radar when people just fail to read through all the financial paperwork. Maybe that’s why they are in so much hot water right now. If you’re making money from the money you are spending on the card or fees you are billed then good for you. Yes, it’s a bit much for going over IMO. How timely. Two days ago I received my statement from RBC. With a $29 charge for going over limit the day AFTER I paid the bill (but it wasn’t posted until the day after). I hope this isn’t going to be an ongoing issue! It’s a very new credit card that I have been using for most household purchases in order to get the perks of the card. You can ask them to put a stop on the credit limit so you don’t go over. That is what we had to do. I know what you mean… the entire thing is silly. We only have M/C these days and it is only used for online orders. Hubby just used it the other day to order the virus protection program we use for the next 2 years, it will cover all 3 computers here. He checks the bank balance and M/C balance every few days. I usually write the charge when we spend it on a sticky note in the bank book and keep any confirmation emails until the order gets here and is OK. Once that charge shows up on the online statement hubby pays it. It will then be recorded in the bank book with the reference number the ba nk gives us……just in case. Well in the past hubby has gone over the credit limit and the twits at the bank raised his limit…..I was not impressed to put it mildly…. These days most of our online orders are paid with Amazon gift cards we got doing surveys online. MasterCard gets used for the computer stuff like the anti-virus program and ink for the printer. Period. As hubby tends to need my help with those orders I can keep him in check. We have two credit cards, PC financial Mastercard and an RBC Visa Preferred card. I use the PC card everytime I grocery shop along with the points card, really makes a difference. Then as soon as I have put away the groceries , I go to my computer and pay it off from my chequing account. The Visa card is used for my husband’s business, and his expenses are substantial. Since we are empty nesters now we like to take a nice winter vacation, which we save diligently for. The $150.00 fee for the card includes a very good travel medical and cancellation plan, which would cost us considerably more at other places. Again, we pay it off every month. This year we got $1300.00 off our vacation ( which was already 20% off for booking early). So it works well for us. Like you, Mr. CBB, Icheck all statements carefully! We have to work harder when it comes to reading the disclosures though but we do read our statements yes. Have a great trip… that’s a huge savings. You don’t want to know how much we just spent on our holiday… shocking. The Euro is horrible as is the pound. Is there a particular reason why you’d keep or use a card with a low credit limit ? I mean, credit utilization is taken into account into credit score calculations, both globally (across all available credit sources) and individually, meaning that having two credit cards used at 50% of their credit limit would be better credit score wise than having one at 95% and the other at 5% for example. With the impact a few credit score points drop may have on a mortgage rate for example, I’d think it’d be better to try to keep it optimized, wouldn’t you agree ? It was a card I got when I first moved to Canada which helped me achieve my credit score which is great. We’ve just recently used it to the limit as it’s hardly used for anything but online shopping here and there. Ideally we are going to cancel and just stick with our two main credit cards. Thanks for your comment. I track every penny that we have on the credit card on a daily basis. Plus, I can regularly log into my credit card companies and check the balance against my running total to catch any fraudulent activity as it happens. Since I keep track of the monthly cash available as well, I simply move the money from the “available” category pn my spreadsheet to “Pay XYZ Credit Card”. I never overspend that way and I feel confident that I am financially prepared to make a lump payment to clear the entire balance once a month on the statement cut-off date. That’s very smart to do. So logging into the credit card account to look at what has been spent may help the over-limit spend.